Yeah, UAE and Singapore are obviously examples of the other extreme the spectrum, but the point is that without the problems that the full spectrum of drugs brings, they are very safe and prosperous places to live - far more so than N.Z. You need to remember that the majority of crimes in NZ as linked to drugs - either crazy/dangerous/violent behaviour by wasted people or people committing crime to fund drugs. Liberalisation aims to reduce the incidence of the latter, but doesn't help much with the former. The other extreme (capital punishment) nips both problems in the bud. More people die from drugs in NZ than Singapore executes, so peculiarly, capital punishment does more to preserve the sanctity of life. Offtopic. Perfectly ok for many characters in the christian holy book also. Back to medical cannabis..
Weed & synthetic weed is being laced with extra stuff, which produces more extreme behaviour than the weed of yester-year. Can you point to any evidence backing this claim? Not the 'synthetic' bit, but the claim that weed itself is being 'laced' (a quick google didn't reveal anything). They are dealing with younger kids that ever before (sub 15 y.o.) getting more wasted than ever before and committing higher level crimes than ever before, such as armed robbery, stabbings/murder, home invasion etc. We're not talking social nuances like burnouts and doughnuts in cars. Apparently the media isn't even reporting the tip of the iceberg. Yeah, alcohol is usually also a factor but weed isn't as natural as it used to be. Weed & synthetic weed is being laced with extra stuff, which produces more extreme behaviour than the weed of yester-year. As someone alluded to above, having super-weed means better business and this won't diminish under liberalisation - it will probably get worse with increased competition. While I'm sure smoking Cannabis isn't causing kids to do armed robbery, stabbings/murder, home invasions, there are clearly problems with the way Cannabis is used in NZ society right now - Apart from the glaring one of feeding money into a $multi million gang influenced illegal cash market. There's no doubt this is a drug that's harmful if used intensively and regularly by young people- and NZ has comparatively heavy rates of youth consumption..It's been proven to produce long-term psychiatric effects in susceptible individuals - and sadly those most susceptible to disorders such as schizophrenia are also far more likely to consume cannabis. And smoking anything's generally bad for you. Whether tobacco or Cannabis - regularly inhaling raw smoke into your lungs is risking cancer, and the way pot's smoked is often particularly bad - in unfiltered joints or inhaled through dirty tar filled pipes. Not only smoke, but unburnt and partly burnt plant material gets sucked into lungs - and illegally sourced Pot's often bad quality (mouldy) of untested strength, grown in some shady grow-op and chemically contaminated. Criminalisation of cannabis use isn't doing much other than having a negative effect on people’s lives. Whether that's ending up with a criminal record themselves or just associating with real criminals to buy the stuff. The question is (assuming replacing NZ's Govt with a repressive one, restricting freedoms in general is out) would legalisation do more harm than good? Sorry, but that's a highly reductionist argument. As mentioned above, those countries' drug policies are simply one example of their draconian laws and wider controls on the freedom of their people - it's this whole gamut of state control, a compliant population, and the specifics of their socio-historical situation (amongst many other factors, I assume) that contributes to them being what they are in your words, 'very safe and prosperous places to live'). And, by the way, two examples of countries I would never, ever want to live in. Haha, They are a cheap rear wheel drive manual car so they are popular with kids, the popular kids have BMW's and a lot of the pop crowd smoke pot. sounds like weed has nothing to do with anything. Burn outs, littering and being a nuisance is de rigueur for bored kids. Nope, nothing to do with weed apart from the weed forces them out of home, them doing skids actually shelled my car with stones when I was walking the dog there previously. This resulted in my call to cops to report and a very irate me. I also see that same car group going around Devonport all the time, thrashing their cars trying to be cool. Where ever you see their cars parked there is rubbish and used bongs etc left on the ground. 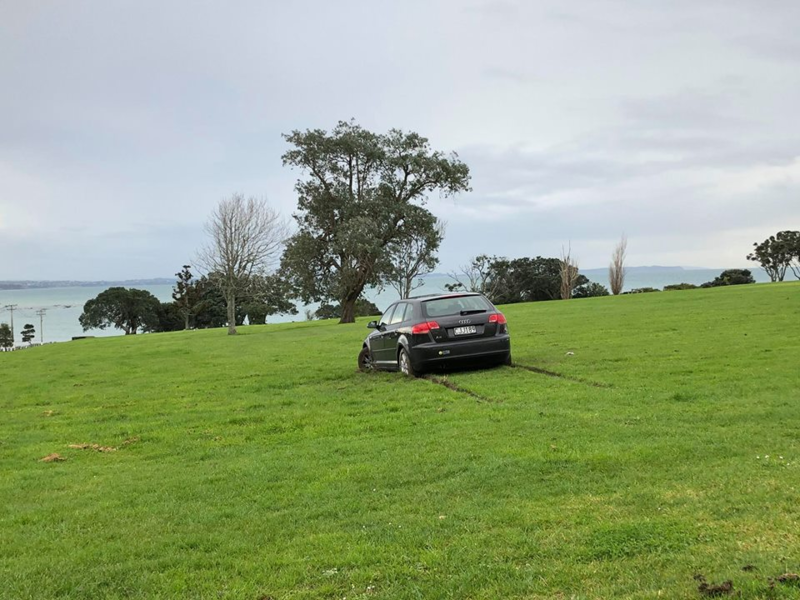 Another example of this group is when they appeared on the local facebook page, one of them must have decided to go and park up at a nice spot to get stoned. Didn't seem to work out well. I do not blame the cops for targeting this behavior, especially in the youth who think they are free to do as they wish. This is Fort Takapuna or Fort Cautley. Huge flat gravel carpark that the community uses. "In Singapore you can find almost anything you desire but one thing in short supply, apparently, is happiness." This is an old discussion that has been discredited many times over. You are of course entitled to believe whatever you wish, but don't try to pass it off as fact. It isn't. Apart from that, it is worth pointing out that a lot of 'drug crime' that inflates statistics is an artificial construct that results directly from drug policy. In other words, the more illegal you make it, the more crime. It doesn't prove a thing in terms of drugs causing bad behaviour. Check out the police statistics. Most of it is hapless individuals who had the bad luck to get caught with a joint, or people growing their own. It all goes into the statistics hopper and for the police it is an easy score. More people die from car accidents than from drugs so, peculiarly, drug use does more to preserve the sanctity of life. ... and the legalisation of weed in certain US states (as well as the more common allowance of possession for medical purposes) has shown the many, many 'delivery mechanisms' that are possible! The docuseries Murder Mountain (on Netflix) raises some fascinating issues I'd not considered in relation to legalisation - the impact on legalisation and all that it brings with it on those previously growing illegally - the compliance costs of going legit are such that it's just not economical for most small growers to survive, meaning the supply will be increasingly dominated by large corporates. A must-watch for those interested in this area. Weed is not being laced, No one would be dumb enough to throw away free drugs and make a bunch of stoners angry by selling them crap. I have heard of this process which I think people are considering it being "Laced". If it is no longer a crime to use it then it is safer, folks will feel free to discuss and dislose their use to medical professionals etc. Allowing for medical Cannabis takes it out of the hands of gangs and other nasties and into the hands of medical professionals a parallel to when we grew up and got sensible about abortion. Plus, of course, the (miss? )use of drug laws by police to force access and undertake searches. synthetic weed isn't weed whatsoever. weed doesn't make teenagers do armed robberies, stabbings, murders or home invasions. Pisses me off soo much that the synthetic poison gets labelled as cannabis, it's as much cannabis as it is lettuce. It seems to mainly get labelled that way by people who are stuck in the past and opposed to reform and lump everything together with no interest in understanding the real issues. Well it didn't help that synthetics were marketed as synthetic cannabis by the companies selling it before it went underground.